Antihistamines seem to be very safe drugs – they rarely cause severe health complications, and many people use them on a regular basis. This may lead to an erroneous assumption, that they can be safely used with other drugs, including alcohol. However, histamine blockers and ethanol interact dangerously. 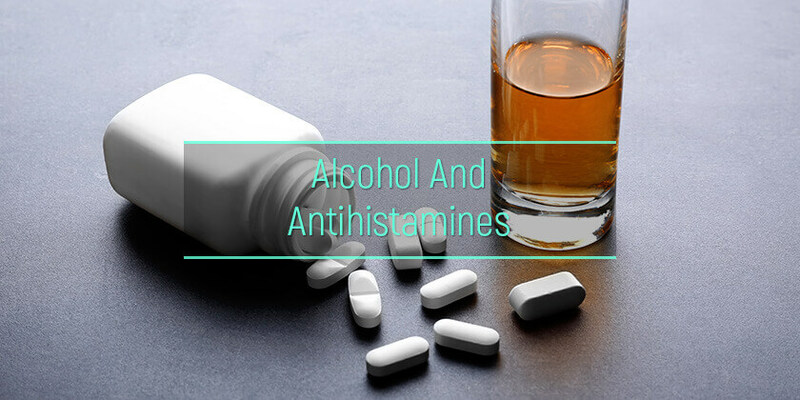 If an individual consumes antihistamine with any kind of alcoholic drinks, it will slow down their central nervous system as they both work as CNS depressants. Read here how the antihistamine medications and alcohol affect health. What are the health effects of antihistamines with alcohol? What are the statistics for consuming antihistamine and alcoholic drinks? Can histamine blockers be used with alcohol-containing cold medications? Does alcohol affect antihistamines effectiveness? Can antihistamines be used for alcohol flush? There are some OTC drugs and prescription medicines that contain an antihistamine, which induces a high level of sedation causing dizziness. The effect of these drugs is exacerbated by the consumption of intoxicant (like alcohol), even in a small amount. The main side effect of consuming antihistamine is a feeling of sedation. When alcohol and antihistamine are combined, it magnifies the effects also poses a danger when driving or performing a serious task. If antihistamine does not have sedation effect, there is a chance of low blood pressure when compounded with alcoholic beverages. According to NIAAA, mixing alcohol with antihistamines can cause vomiting, nausea, headaches, loss of coordination, and drowsiness. Likewise, when alcohol and Xanax are combined, it magnifies the above problems and leads to slow breathing, pulse, and sometimes, coma. The National Highway Traffic Safety Administration also suggests that antihistamine has a greater effect on a driver’s ability to stay alert as compared to the consumption of alcoholic drink. Note: An individual may also suffer from the same effects if they consume azithromycin and alcohol together. 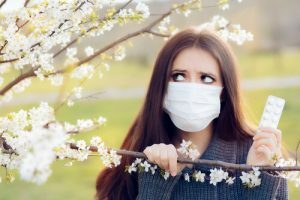 Almost 20 million people over 18 years old were diagnosed with hay fever in the US in 2017 alone. About eight more million reported about respiratory allergies. Most of these people were prescribed or self-medicated with antihistamines. About 85% of Americans over 18 drank alcohol at least once in their lifetime, according to the National Institute on Alcohol Abuse. A 2016 study measured the effects of l-mequitazine, antihistamine mequitazine alone, and then with an alcoholic drink. The volunteers were subjected to both the drugs and their driving performance was assessed using a driving test in normal traffic. The first parameter to measure their performance was Standard Deviation of the Lateral Position (SDLP). Secondary parameter consisted of a word learning test during driving. It was found that l-mequitazine and antihistamine mequitazine alone had no effect SDLP during the test, but it was increased significantly after they consumed antihistamine mequitazine together with an alcoholic substance. It impaired all their performance measures and participants were also aware of its effects. There is a diverse range of over the counter medicines (OTCs) that work quite well to treat common cold and flu. However, some of these cold medicines contain alcohol. Antihistamines are also sometimes prescribed together with treatment for common cold, mostly for running nose or to prevent the allergic reactions to some of the medications. So, the question is whether it is safe to use antihistamines at the same time as alcohol-containing cold medicines. In most cases, it is safe, as far as the alcohol content in the cold medications is not big enough to cause any severe interaction. However, the prescribing doctor must be aware of all the medications the patient is taking. In rare cases, the combination of ethanol and anti-allergy pills can lead to drowsiness, dizziness, impaired motor ability, fatigue, and lack of concentration. Even the anti-allergy inhalants and alcohol, when combined also lead to serious health issues. Such interactions shall be discussed with a doctor before taking these drugs together. Further, there are steroids that are used for the treatment for hives, but steroids with alcohol should not also be consumed together as they suppress the immune system. Does Alcohol Affect The Effectiveness Of Antihistamines? Yes, alcohol affects the effectiveness of Antihistamine, especially if speaking about the medications of older generations. Even a small amount of alcohol can affect the antihistamines effect as it increases the chances of making one feel sleepy. Moreover, alcohol is metabolized in the liver, and a lot of drugs also goes via the same path. So, it comes with the potential to interact with the whole host of drugs. For some, consuming drinks can get them a lot more than tipsy. It turns their skin red, which is sometimes referred to as Asian Flush. However, it is considered that taking antihistamines prevents skin from having the Asian Flush. The USC experts say that using antihistamines such as Zantac prevent the alcohol-induced flushing. But the combination of alcohol with antihistamines leads to various health problems. A study published on NCBI also suggests that this combination, antihistamine alcohol flush leads to an increase in ethanol concentrations and a decrease in dehydrogenase, which affects the psychomotor skills of an individual. Thus, although these medications can be quite efficient in treating Asian flush, the possible complications are too severe. It is a bad idea to use the drugs in such a way as the risks outweigh the benefits. Histamine blockers and intoxicants are harmful drugs. If an individual combines intoxicants like tobacco and alcohol with antihistamines, it can lead to serious health effects. They are just made for short term usage, so make sure to wait before consuming any intoxicants. There are medications including mouthwashes and cold medicines that have some alcoholic content and also interact with histamine blockers. To keep the effects of this combination at a bay (medications including antihistamines, cold medications, and aspirin and alcohol) consult a doctor on how long to wait before consuming an alcoholic drink. In case the alcohol dependence becomes a problem, do not hesitate to ask for help. There are many alcohol abuse therapy options available. They include both residential and outpatient treatment centers for alcoholics, as well as behavioral and holistic therapies.